Another book by Adam Scott Kennedy, this time with his wife Vicki, and this time featuring the animals around the Masai Mara in Kenya. When you think of Africa, lions, elephant and giraffe come to mind. The great wildebeest migration also comes to mind. However, there are a great many more fantastic animals to be seen, if you're lucky enough. 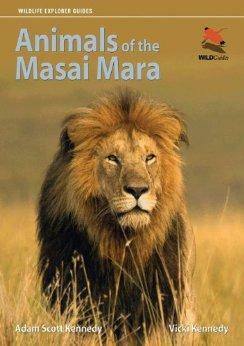 If not, you can always enjoy a book like this one whenever you need any wild animal fix. You can also download a checklist of animals from the WILDGuides website (www.wildguides.co.uk). This book is also easy to navigate and is not bogged down by technical data and information, but does include scientific names, habits, recognition and diet among other information. Obviously when going on an African safari the aim is to view The Big Five (Rhino, Elephant, Lion, Leopard and Cape Buffalo), but there are so many worthy extras, that if you don't see all five, you'll still be amazed and enthralled by what you do see. I've seen a few animals in my time, but there are still some I'd love to see in the wild, like a Cheetah, African Civet, Eland, Vervet Monkey, Nile Monitor and the Blue-headed Tree Agama. This is a beautiful photographic introduction to Africa's beauty, and it is well worth reading. Use Kennedy's book Birds of the Masai Mara to see what you can expect to encounter on your trip, and combine these two books in mapping out what you want to see. Conclusion - This book should definitely be on your reading list if you're considering an African safari in Kenya and the Masai Mara. Gorgeous photography.